Production Summary: Ten songs were recorded specifically for this album, as "This Is the Life" was recorded and released as a single a year before to promote the movie Johnny Dangerously. Of the remaining songs, only eight were newly written for this album--as "George of the Jungle" was simply a straight cover with no altering of the lyrics or music, while "Yoda" was a fan-favorite home-recorded and live-concert song dating back to 1980 before finally making its studio-recorded debut here. Dr. Demento Status: Ten of the album's eleven songs have aired on the syndicated Dr. Demento Show, with the last song to premiere on the show being "Cable TV" on March 20, 1988. By the time The Dr. Demento Show ended its run on terrestrial radio on June 5, 2010, "Girls Just Want to Have Lunch" remained the only song from the album never played on the program. Tour Status: As of this update, 73% of this album has been included in a regular tour setlist. One of the first comedy albums (and Al's first album) to be released on compact disc. The first ALbum to include a paper sleeve with lyrics and credits printed on it. Likewise, the first album to list the address for Close Personal Friends of Al. Debuted at #92 in Billboard, a record debut for an Al release until 1992. It would eventually stay on the "Billboard 200" chart for sixteen weeks. 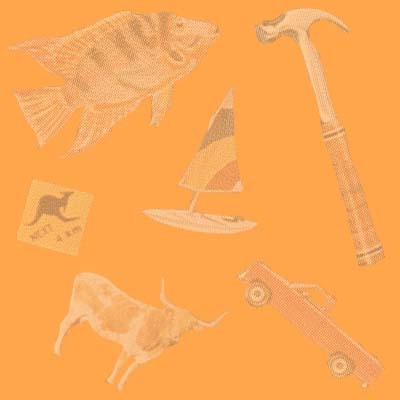 Ties with Polka Party!, the UHF soundtrack, and Alapalooza as having the fewest number of parodies of any ALbum, four. Released in Japan on July 21, 1985. All five of the original songs on this album would be featured on singles, while only two of the parodies would become singles in the United States. Additionally, both "Hooked On Polkas" and "Girls Just Want To Have Lunch" would be featured on singles in Japan and Mexico, respectively. Among Al's albums, this one holds the record of having the most songs off it appearing on worldwide singles, not to mention the second most on domestic singles. The first ALbum to have not only one of its original songs become a single, but also in Japan, its polka medley as well. 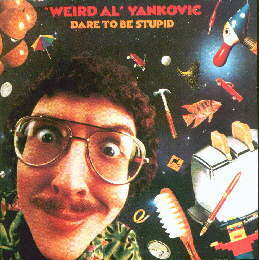 ALbum title/song connection: "Dare To Be Stupid" is the first original song on the album (as you should have already been able to see). Etched onto Side 1 of most copies of the LP: "More Songs About Television and Food," a reference to Talking Heads' 1978 album More Songs About Buildings and Food. For reasons unknown, there is nothing etched onto Side 2 of any copy. The lyrics to "Hooked On Polkas," you ask? According to the LP sleeve, "You know the words." Ha ha, you certainly do. The lyrics to the polkas (or lack thereof) would be handled in a number of different ways in future albums. Even though the artwork on the insert of the original CD release wraps around like on the LP jacket, the artwork on all CD reissues do not match up. Above: Inside the "booklet" of the original CBS compact disc. The insert consists of a four-sectioned fold-out. Opening it reveals this picture and the credits. Unfolding it completely reveals the lyrics to the songs over a faint close-up photo of Al's face. STILL NEED THIS ALBUM? ORDER THE CD FROM AMAZON! This page was last updated March 14, 2019. Scan of Yoda sticker and additional research courtesy of Dave "Elvis" Rossi. Dare To Be Stupid ©1985, 1990 Scotti Bros. Records. ©1999 Way Moby/Volcano Entertainment III.